The Cat and The Bear… and Baby Elephant! Kithaka, which means ‘forest’ in the Meru language, was only around one week old when he was found wandering alone in a village near Imenti forest in Kenya, separated from his family. The orphan baby elephant was then transferred to the Nairobi Nursery, an elephant orphanage managed by the David Sheldrick Wildlife Trust. The trust has this great project called the Orphan’s project, with the purpose of maintaining the elephant and rhino populations in Kenya, which are threatened by ivory and horn hunters. When the adults are killed, the babies left behind cannot survive by their own, and will eventually die. That’s why there has to be a place to nurture and take care of the orphans until the time they can reintegrate back into the wildlife. They invite us to support the project by adopting the orphans, becoming their foster parents. Besides a fostering certificate, a foster parent will get monthly updates about the orphans. They also publish a diary to let the foster parents keep track of each orphan’s update. I’m so drawn to their stories that I could read the diary for hours, or read it over and over again ^^. Back to Kithaka, now that it has been 2 years since he was first found, it seems that he grew up to be a cute but evil and naughty toddler elephant :D. His favorite activities are playing football in the mud and the ‘pushing game’ with other baby elephants. Here you go, some entries from the Keeper’s Diary about the naughty Kithaka, a proof of his mischievous behavior *giggle*. …Mischievous Kithaka cannot resist causing a stir during the public viewing hour. Today, he ran along the cordon separating all the local school children, deliberately bumping into them, which made them scream and retreat, something he thoroughly enjoyed. …During the private visit at 3pm Kithaka was very naughty and bashed Lemoyian, who was busy drinking water from the barrel, knocking him into the barrel head first. Kithaka was quick to run away as the keepers helped Lemoyian who retaliated by charging at Garzi, blaming him for what happened as he was closest to him when the incident occurred. 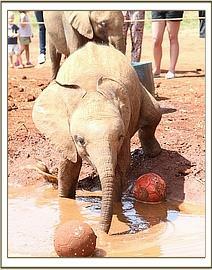 You may wonder how successful the project is to reintegrate the orphans back into the wild. My favorite story is about Emily. Her story of becoming an orphan is so sad, yet somehow a bit funny. When she was about one month old, she fell down into a pit toilet, and was covered in stinking human feces. When they tried to reunite her back with the mother, the baby was rejected because the mother couldn’t recognize her due to the overpowering scent of human dump ^^;. After the orphans are ‘graduated’ from the nursery, around 2 or 3 years old, they will be transferred to the Ithumba or Voi Rehabilitation Units in Tsavo East National Park. There, the reintegration process begins. Usually after they are 8-10 years old, when they themselves decide that it’s the right time, they will voluntarily go back into the wild. Emily is one of the success cases, she’s 20 years old now, living happily within a wild herd, and having a baby with a wild elephant as the father :).